Dreamworks' latest animation doesn't disappoint with an original, quirky premise and impressive voice talents. When I first saw the trailer for The Boss Baby, I knew I needed to see this film. When a trailer makes me laugh as much as it did, it usually means one of two things: either this film was going to be incredible, or all the funny moments had been used up in the trailer and the rest of the film would be mediocre at best. Somehow, The Boss Baby was a bit of both. This film is by no means spectacular, and many of the funniest moments were revealed beforehand in the trailer; beyond this, however, the family-oriented animation had heart, and made for good, light entertainment. The amusing premise of the film sets up the audience for some fun right from the start. Forget everything you thought you knew about the joys of childbirth; babies are produced at a large corporation aptly named BabyCorp, and are sorted into one of two categories immediately. Those with a friendly disposition are sent down the Family chute, to be raised by parents and live like, well, babies. Those not intended for a family life are sent to Management; these are the solemn-faced babies destined for the corporate world behind a desk working for BabyCorp (in a satirical view of the balance between family and work), never to experience a life with parents. The titular character Boss Baby (genuinely his name) is sent on a mission to prevent PuppyCo from introducing its new product, the Forever Puppy, which never grows old, as they pose a threat to babies everywhere. The logic is that a cute puppy which never ages would be far preferable to a screaming child yet to go through puberty, but make of this what you will. This is how Boss Baby finds himself in the Templeton household, as the new younger brother to seven-year-old Tim, who is less than pleased to have his only child status ripped away from him. Upon discovering his new brother can talk, let alone work for a business firm, Tim agrees to help the suited baby succeed in his mission so that he can return to BabyCorp, and Tim will once again have the undivided attention of his parents. Dreamworks have once again produced a sure family favourite here. With the voice talents of Alec Baldwin as the title character, there are as many witty jokes and comments for the adults’ benefit as there are for the kids. The animation, as per their standards, is flawless and impressive, and even the soundtrack will please an older audience, including classic tunes like ‘Blackbird’ by the Beatles. The film is visually and aurally appealing, and the plot, although predictable at times, is very enjoyable. If you’re a Dreamworks fan, their newest work is not to be missed. It’s an hour and a half of kid-friendly fun, and its sweet ending could well leave you feeling warm and uplifted. 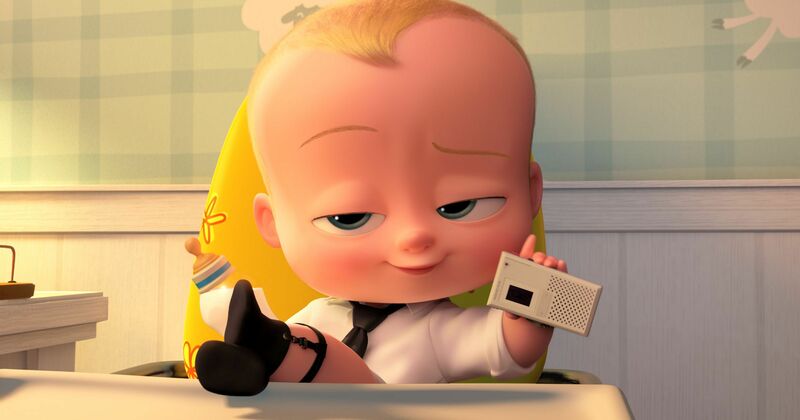 For a light-hearted, pleasurable experience, The Boss Baby is definitely one to watch. The Boss Baby (2017), directed by Tom McGrath, is distributed by 20th Century Fox. Certificate U.